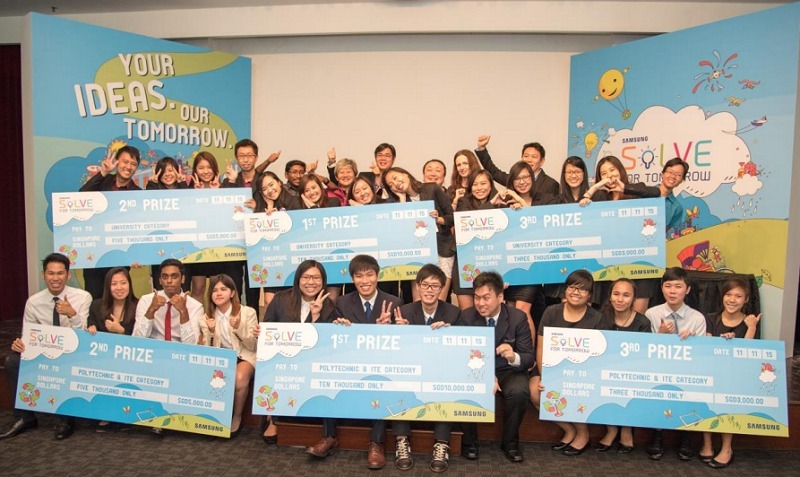 There’s a popular saying which states that students are the leaders of tomorrow, and nothing put it more clearly than the recently concluded Singapore edition of Samsung’s Solve for Tomorrow. Held for the second year running, the competition challenges students to come up with possible solutions to social issues by leveraging on technology. A total of 85 teams representing 14 universities, polytechnics and Institutes of Technical Education (ITE) took part in the competition. Here are the ideas of the top 6 finalists. 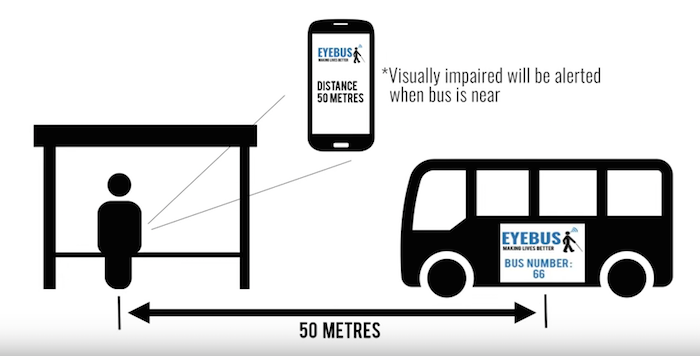 Eyebus is an RFID system that enables the visually handicapped to travel independently by alerting users when their buses are arriving. Users simply select the buses they want to board, and when the bus with an RFID sticker arrives, the user will be notified to board the bus. 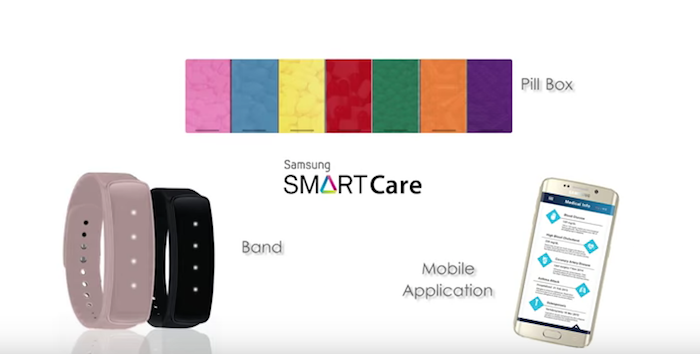 SMARTCare is an integrated solution that consists of a wearable band, pillbox and mobile application to remind the elderly to take their medication. It works as a personal digital nurse that offers a wide variety of functions, like notify users of upcoming medical appointments, medication timings, monitor medical records and more. Users can also update their records during medical appointments via the Smart Band, without having to bring along hardcopy documents. Ping is a mobile application and wearable device that facilitates communication with the hearing impaired. 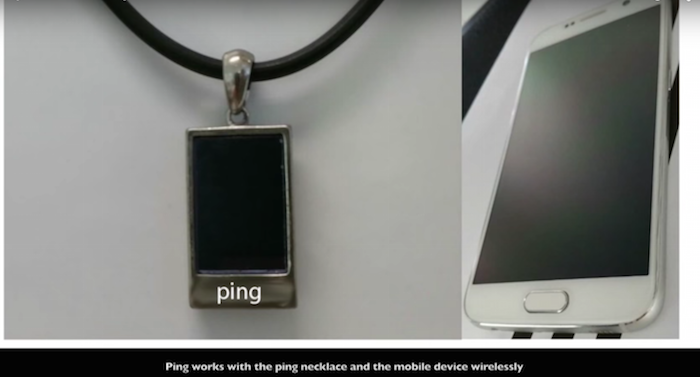 Worn as a necklace, Ping can capture hand gestures signed by the hearing impaired, and the mobile app (connected to the device wirelessly) will convert the sign language into words. In addition, the Ping app also has the ability to capture speech and convert them into words on the mobile screen. SafeSnooze is a mobile application that combats fatigued driving to keep sleepy drivers awake and alert. It uses a phone’s front facing camera to monitor eyelid movements, and once it detects sleepiness in a driver, it will play a personalised mix of music, jokes and radio programs to help the driver stay awake. The app can also help the driver navigate to the nearest rest stop for a quick rest or to grab a perk-me-up. BeepAID is a wearable healthcare companion that actively monitors the well-being of the elderly. How, you ask? BeepAID users wear a device that actively monitors for falls through constant communication with the cloud. With the help of measuring biometrics, BeepAID can also detect falls in emergency situations where the elderly might be unconscious. BeepAID also serves as a healthcare companion, connecting the elderly to others nearby who are also using the device. Sharity is a mobile application that connect volunteers to voluntary welfare organisations and their beneficiaries. Volunteers can choose to help out or be involved in the various campaigns listed on the Sharity app. This concept reminds us of StartNow. Our favourite team from the top 6 would be Eyebus, which solves a real problem. While we are surprised that no one has implemented this yet, that’s probably because the cost incurred would be too high. The team might need to refine the idea more, though, since their proposed solution might not be feasible with smartphones — navigating mobile phones is still one of the everyday problems that many from the visually impaired community experience. The winning team from each category wins $10,000 cash, a study trip to the Samsung Headquarters in Korea and internships at Samsung Electronics Singapore. The first runner-up and second runner-up will win $5,000 cash and $3,000 cash respectively. All team members from the 6 final teams were also given an 8-inch Samsung Galaxy Tab S2.